Terminal values and time-varying gaps suggest IWM as the winner. All funds have large drawdowns during the 2008-2009 financial crisis. Relative to the ETFs, the FUNDXX Upgrader funds generally perform better early in the sample period than later. HOTFX does not notably outperform FUNDX. For another perspective, we look at compound annual growth rates (CAGR) overall and for two subperiods. 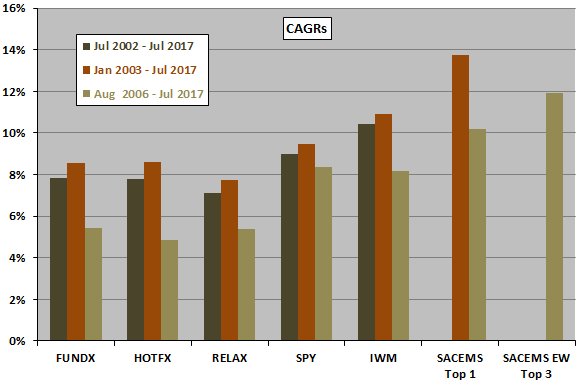 The next chart compares CAGRs of all funds/strategies since July 2002, January 2003 and August 2006, reflecting later availabilities of SACEMS variants. The FUNDX Upgrader funds do not stand out based on CAGR, and they may have had a lucky start. Next, we compare maximum drawdowns (MaxDD), all of which occur during the most recent subperiod. The next chart compares MaxDDs for all available data. All MaxDDs occur since availability of SACEMS EW Top 3. Results indicate that the FUNDX and HOTFX strategies do not mitigate market drawdown. RELAX and the SACEMS variants do. For additional perspective, we look at monthly performance statistics. As for MaxDD, FUNDX and HOTFX do not suppress volatility compared to SPY. 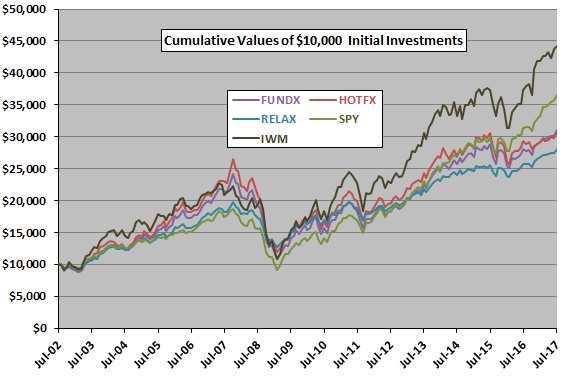 RELAX does suppress volatility, but with a large average return sacrifice. 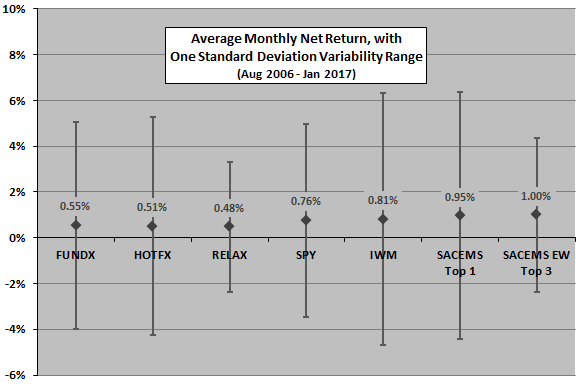 Rough monthly Sharpe ratios (average returns divided by standard deviations) are 0.12 for FUNDX, 0.11 for HOTFX, 0.17 for RELAX, 0.18 for SPY and 0.15 for IWM. Those for SACEMS variants are 0.18 for Top 1 and 0.30 for EW Top 3. In summary, evidence suggests that FUNDX Upgrader funds of funds do not outperform the broad U.S. stock market and that investors may be able to find simple self-managed strategies that do better. It appears that the FUNDX Upgrader funds are too equity-centric to provide equity market crash protection. Potential simple remedies for this shortcoming include a simple moving average rule overlay as illustrated in “Simple Sector ETF Momentum Strategy” and “Doing Momentum with Style (ETFs)” or inclusion of funds for non-equity asset classes as in SACEMS. The former two remedies go to cash, while the latter looks for returns from other asset classes. The available sample periods are short for annual measurement intervals, and very short in terms of number of bull and bear markets (and dominated by the 2008-2009 financial crisis). 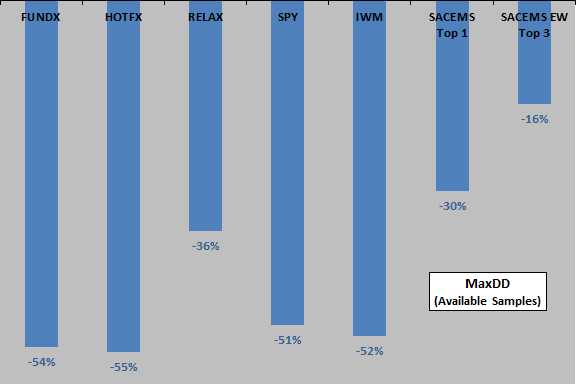 Performances of SACEMS Top 1 and EW Top 3 are gross, not accounting for costs of monthly portfolio adjustments. Also, SACEMS is partly backtested.